What Is Sacroiliitis, and How Does It Affect Arthritis? 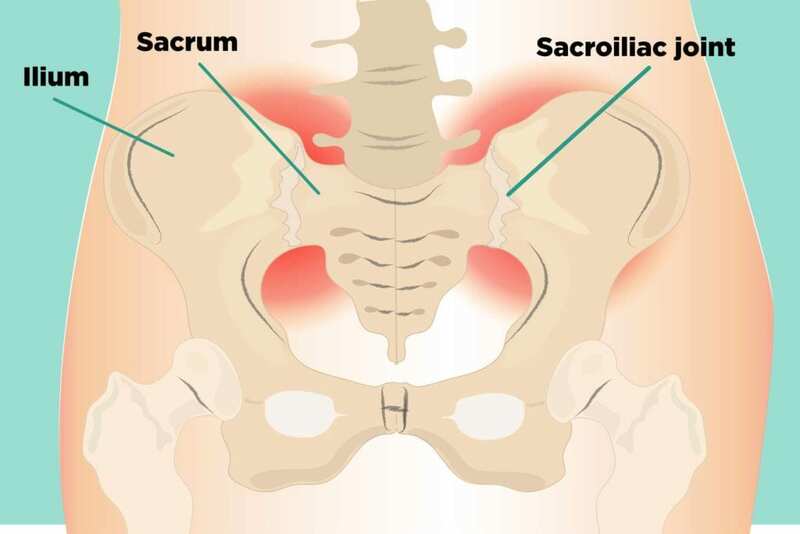 Sacroiliitis is inflammation of one or both of your sacroiliac joints. Called SI joints for short, they are situated on each side of your spine, and connect the sacrum (or base of your spine) to the ilium (the top part of your pelvis). Their job: to carry the weight of your upper body when you stand or walk. What Does Sacroiliitis Feel Like? This inflammatory disease affects the joints of your spine, or vertebrae, as well as SI joints. In fact, sacroiliitis is often an early symptom of AS, with symptoms such as pain and stiffness in your lower back and hips. This form of inflammatory arthritis sometimes occurs with psoriasis, a condition where scaly red and white patches develop on the skin. Psoriatic arthritis in the spine, called spondylitis, causes inflammation in both the vertebrae and SI joints. Here are other psoriatic arthritis symptoms you could be overlooking. Known as wear-and-tear arthritis, OA occurs when the cartilage that cushions and protects the ends of your bones gradually deteriorates. Aging, obesity, and other factors take a toll on your SI joint’s cartilage, which can lead to inflammation and joint pain. This is different, however, from the inflammation in AS and PsA, which occurs because your immune system is attacking healthy tissue there. Injury: A sudden impact, such as from a fall or car accident, can damage the SI joint or the ligaments that support the joint, leading to inflammation. Pregnancy: Hormones that your body makes when you’re pregnant loosen the muscles and ligaments of your pelvis to prepare for childbirth, which leads to changes in the way the joints move. Plus, extra weight of pregnancy can put more stress on the SI joint, causing additional wear. Infection: In rare cases, a type of staph bacteria can cause the SI joint to become infected. There are many potential causes for low back pain, which makes sacroiliitis sometimes tough to diagnose. Your doctor will start with your medical history, as well as conduct a physical exam. Applying pressure to your certain spots on your spine, hips, and buttocks, as well as moving your legs into different positions, can help determine the cause of your pain. Your doctor may also order blood work to look for signs of inflammation; an X-ray of your pelvis to see if there’s any damage or changes in the SI joint; or an MRI for a more detailed image if he suspects axial spondyloarthritis or ankylosing spondylitis. Numbing injections (anesthetics) may be another option to help with a diagnosis. If an injection into the SI joint stops the pain, sacroiliitis is the likely cause. How Can You Relieve Sacroiliitis Pain? Step one: Avoid doing the things that make you hurt. Modify or avoid activities that worsen your pain to help reduce inflammation in the SI joint. Medications: Your doctor may recommend non-steroidal anti-inflammatory meds (NSAIDs) or prescribe a muscle relaxant to help reduce spasms that can occur with sacroiliitis. Tumor necrosis factor (TNF) inhibitors can help relieve sacroiliitis that’s associated with ankylosing spondylitis or psoriatic arthritis. Physical therapy: Range-of-motion and stretching exercises can help maintain flexibility and strengthen muscles to help stabilize the SI joints. Other procedures: In some cases, your doctor may inject steroids into your SI joints to help decrease inflammation and pain. He or she may also consider radiofrequency ablation; here, radio waves are used to damage or destroy the nerve causing your pain. In rare instances, you may need surgery to fuse the joint together to relieve pain.